The new Darkest Dungeon update not only adds Town Events, it represents the fulfillment of the last of the Kickstarter game feature stretch goals. 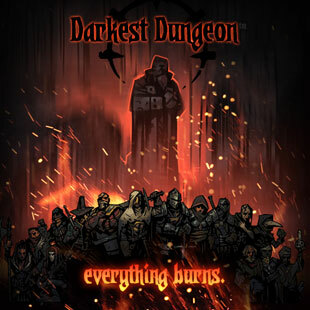 Darkest Dungeon has definitely been a success story for both Kickstarter and Early Access. Tomorrow, Red Hook Studios will roll out a new update to the game that not only adds new content, it finishes off the last game feature stretch goal remaining. Red Hook says that it will now focus on producing the physical rewards for its successful Kickstarter. The new update, titled "Everything Burns," adds Town Events. These events mean that when you come back from a quest, you may find that things in the Hamlet have changed since you left. You may have bonus recruits or extra supplies, but you could also find some local facilities closed. Red hook also says that "The Hamlet is not as safe as it once was..."
Other changes in this update include a default party order button, new visual effects in the Hamlet, and a number of other fixes. The new update will land on Steam tomorrow, but if you're both adventurous and impatient, you can opt in to the beta branch right now. Instruction son how to do that, as well as a full list of the changes included in the update, can be found in this post on the Darkest Dungeon website. *Cracks knuckles* Been meaning to actually beat this game. Seems as good a time as any. Time to reserve a room in the local brothel because this update is going to up the stress level of this game. I got bored of it long ago. It's a neat little game that does a lot of things right, but when all is said and done it's just too damn grindy with gameplay that isn't meaty enough to last the distance. Still waiting for this to come to PS4. Looks like July or August now. Sigh. I really want to play because it looks interesting. This is exactly why I dropped it about halfway through. Was about to pick it up again, but something tells me having the town as a source of rng slaps to the face is only going to put me off more. Like if opening the ship upgrade menu in ftl occasionally resulted in systems exploding and hull breaches. The really scary thing is that it's coming to Vita as well, which means I can't just walk away from it anymore. Wasn't the vita ver supposed to have been out in spring. There's not much spring left. Maybe they wanted to add all this stuff to the console version from the get or somehing. Ah well. Gah, this is one of several games on my going to get to it at some point list. The game play reminds me of Nethack style where you are battling a house of stacked cards and RNG barriers of entry. I do like the concept though and they made a neat intro trailer for it. If it had deeper content I think it would have moved higher on my get to it list. Good point about portable gaming, I could see lots of pause and play there heh. I am yet to survive a level five quest, let alone reach the bloody Darkest Dungeon itself!